Whaddyagot for me… We have some of the smartest, smallest, most attractive and simple to execute bakery merchandisers! We know what works to sell our products in foodservice. Check out our Slant-Back Cookie Racks, which take up only 3.5 inches of counter space, our Acrylic Bakery Cases for beautiful bulk displays or our Cookie Warmers for warm and delicious bulk cookies all day long. Our Slant-Back Cookie Racks slant the cookies up toward the customer and stacks them in a way that provides easy access. We know counter top space is at a premium. That’s why the Slant Back’s width is less than that of a business card (3.5 inches wide). Stores that keep it full and keep it fresh report that the Prairie City Bakery Slant-Back Cookie Rack makes the Prairie City cookies the best-selling food product per square inch in their store. This is the ultimate impulse sale. Your product will turn, turn, turn! Put a Prairie City Bakery Slant-Back Cookie Rack anywhere near your c ash register, and it will be your #1 selling impulse item. Our 2-tier rack is designed to show off two different cookie flavors at once, which, when full, holds 18 cookies. We also offer a 3-tier, 3-tier with removable tray to display Brownies or Ooey Gooeys, Slant Back Quad and more. Download our Merchandising Solutions sheet for a variety of display options. Psst… Prairie City Tip: Always keep the #1 flavor, Chocolatey Chunk Cookies, on the rack at all times and rotate through the other flavors. Do you sell a lot of cookies? Get a second rack FREE. Remember to rotate and refill daily. Nobody buys the last two. Available in 1, 2, and 3 tiers, this attractive wire rack makes merchandising Prairie City Bakery wrapped pastries simple. Each shelf holds up to 4 Muffins, or 3 Danish and/or Cinnamon Rolls. Mix and match to keep it fresh. Psst...Prairie City Tip: You can double the amount of pastry you sell by offering an everyday Meal Deal. For example: Offer Any Prairie City Bakery Wrapped Pastry and a 16 oz Coffee, for just $2.49. 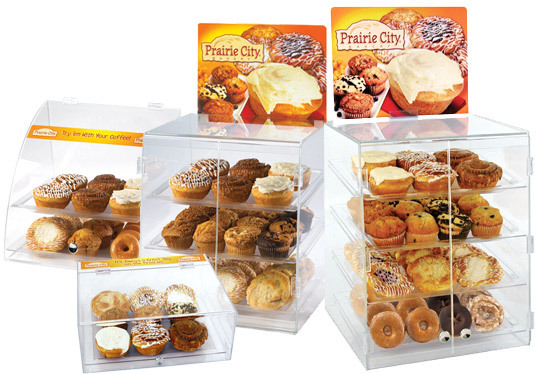 Our attractive, acrylic bakery cases show off your Prairie City Bakery bulk product while keeping it fresh. Cases are available in 3 to 4 tiers, and come with appealing header cards, tongs, POS shelves, and individual product stickers for shelves. With our bakery cases, you invest in the merchandiser, and we invest in you by giving you FREE product with your initial product purchase. When you sell the free product at your regular price, it helps to offset a portion of the cost of the case—now you’re in the bakery business with delicious, quality products. Download our Bakery Case Order Form to get started. Psst…Prairie City Tip: Our foodservice 4-packs are the perfect Bakery Case Solution, offering variety with just the right amount at the right time. Mix and match what sells best. No more waiting on a driver or having too little or too much product. Our program puts you in control of what and when products sell. What’s better than a Prairie City Bakery Cookie? A warm Prairie City Bakery Cookie! Now you can serve warm cookies all day with our simplified warmer program―ready in minutes. Our 1.5oz and 1.25oz bulk cookies are designed especially for the warmers, and are packaged with pre-printed Warmer bags for smart merchandising—serve 2 cookies to a bag. 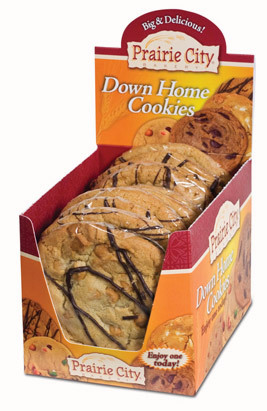 Visit Our Products section for more information on Warmer Cookies. Our branded warmer program offers 3 warmer sizes from which to choose: Small, Medium and Large. Download our Cookie Warmer Program Sell Sheet with Warmer Order Form for all the details.